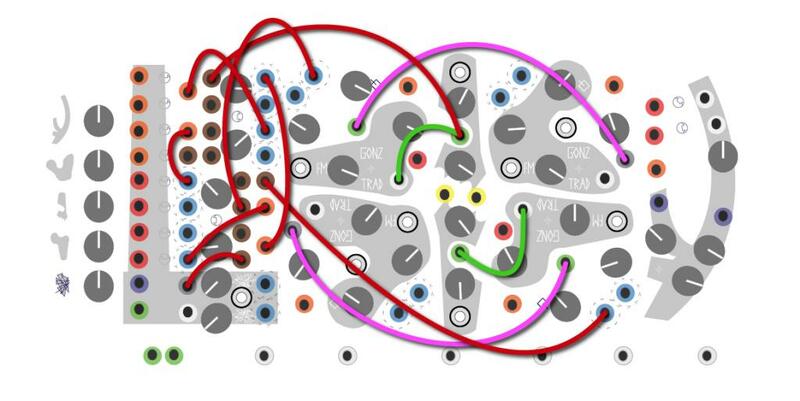 So since the plumbutter is the most patch-able CL instrument, since there is a picture of the layout on the website, and since it is quite a beast to tangle with, I thought that maybe we could share some patches digitally for some sorts of inspiratorial cross-modulation. Heres the template that I grabbed from the website. I filled in the alpha channel to improve readability. Kozepz shared an adobe illustrator file https://www.muffwiggler.com/forum/viewtopic.php?t=58821&start=300 to help make these patches prettier but as I am running linux, I just felt like doing the patches by hand in GIMP. Thanks for the awesome idea kozepz! Here are the patches that I have made so far. Instead of putting together an entire patch, which would be probably unreadable, I try to strip down the patch to the "essence" of what's going on. Therefore wherever you see a module being driven by a rolz that has nothing connected to it, feel free to color in the empty spaces. Same goes if there is a patch that involves only rolz and is connected to nothing. In these patches I use red cords to indicate triggers, green for slow modulation CVs and pink for audio. I chose those colors to contrast from the colors that are already there but feel free to use your own color scheme. This patch only deals with audio. Higher energy (ie high Q and high speeds etc) yields more conventional feedback but once you pull back on the throttle a little bit the feedback decays into crazy FM screeches that fade in and out. 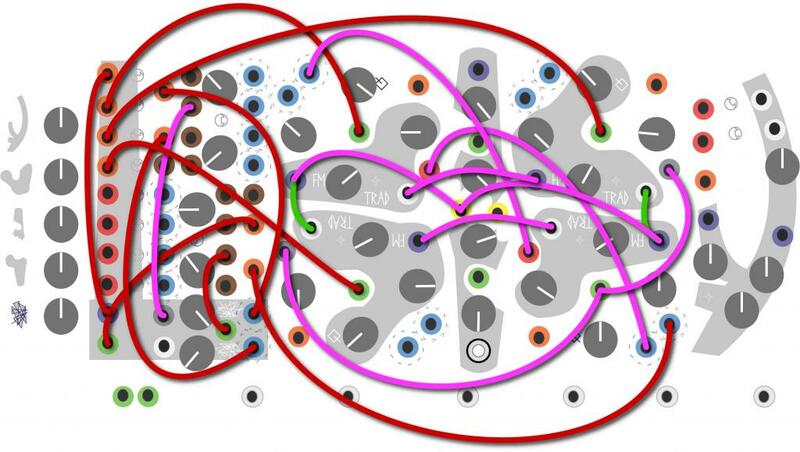 This patch only uses one trigger but uses cross-triggering to make synchronized generative burbles. Very rhythmic nonsense can arise from this one. Great patch ideas! Thanks for posting. I use cross-modulation patching a great deal and I can't wait to try out yours. I've documented some P.B. patches by printing out non-color copies of the graphic and drawing on them. I'll have to see what I can use for drawing on these as graphics with the Macbook. made a few more patches. This one has a really nice pitched hand drum type of sound resulting from the gong cycle position being fed back into its pitch input. You may have to play with the verso/ inverso inputs and try each one as I have noticed sometimes the filters wont open up when these are modulated. So i really like using the snare module as a CV source / modulator but I dont know about using it for sound simply because there isn't much that you can do with it besides feed it triggers. Someone prove me wrong please. This patch can go all kinds of places but I generally just put the Q all the way up on both gongs so they self oscillate and then play with the FM knobs and quantum dust knob. This one makes some wonderful, gutteral thick bass glitches. For something more straight-forward rhythmic get rid of the green grey plug to blue plug connection. That modulates the wait time for the gong counter. 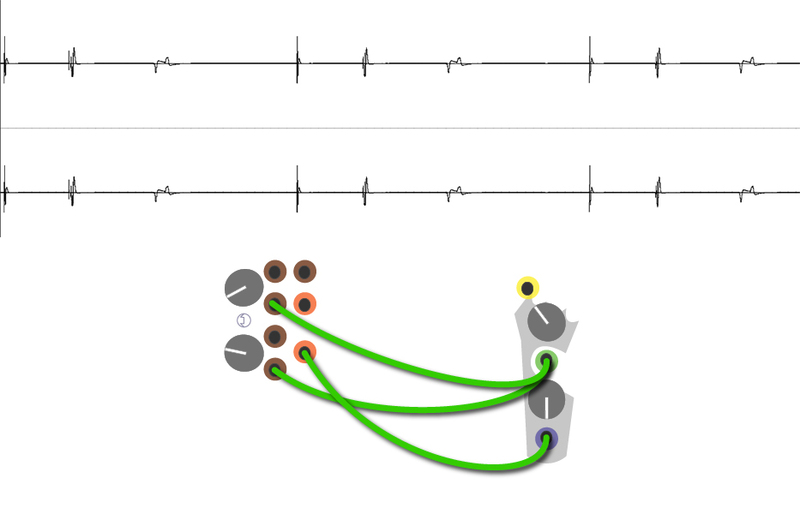 This is an adaptation of my earlier circular feedback patch (which one haha) that basically takes all of the rhythmic operation of each module and has them cross modulate in both directions. The audio cross modulation is optional but it sounds pretty good. Thanks Windspirit for the patches and descriptions! Real fun patches, it really helped and inspired me! Yay! Thank you for sharing looking forwards to trying this out. Gonna post a video of the most recent circular rhythmic modulation patch soon. The symbols with the white circles are the stripped bananas for touch. Did you have a breakout box? another patch to start with. heres a demo of the most recent circular rhythmic feedback modulation patch that I uploaded. I was maybe 2 patch cords short of having the feedback go in both directions. and I like your setup! yeah man, most of the cables are pomona, which are 1$ for each plug. Its cool because you can change the length/ color wire. Its also very easy. I've checked mouser, they charge the double...have to look further but I like the smaller cables. You have to play with the rate knob of the rolls a little, because when I turned PB off and on the next morning the heartbeat was gone. Playing audio out of d'horn through rollz into u'sound. Actually found by mistake. I wanted to see the difference between the red and white outputs of the d'horn on the blue ones from the rollz, but hey I got sound with some rhytmic variation.